Memory foam is a very popular choice in the mattress world right now. However, it’s not without its drawbacks. Many who are struggling to get on board with a fully memory foam mattress are likely to enjoy a hybrid. Here is the guide to help you choose the right mattress for you – in terms of feel, support and personal preference. Memory foam mattress is viscoelastic foam. A memory foam mattress combines layers of memory foam with other foam layers. The raw material was originally conceived to be used in airplane seats. It then began being used in hospitals to help those who needed spinal support and to alleviate bed sores, before gradually making its way to the consumer market in the form of mattresses and pillows. Memory foam is initially firm to the touch, but due to body heat and pressure eventually starts to mold around the contours of the body. A hybrid mattress, like a hybrid car, combines two different things. It usually refers to a mattress which combines innerspring and foam, sort of a combination of a traditional and a more modern mattress. The “core” of the mattress is typically made of pocketed innersprings, while the top “comfort” layer is memory foam. The memory foam layer is usually at least 1.5 inches deep. Memory foam mattresses are usually quite durable and often feature lengthy warranties. They offer great specialized spinal support and alignment, making them potentially a great choice for those with back problems. Memory foam offers very little in the way of bounce. This is because it is slow responding, and generally absorbs pressure. For those who sleep with a wriggly partner, this can be a huge benefit. You’re unlikely to be woken up by your partner’s movements on a memory foam mattress. Memory foam mattresses are also easy to clean, as they require only a wipe down. Many models are hypoallergenic, and resistant to dust, mites and other airborne allergens. Some people find the sensation of lying on a memory foam mattress to be very uncomfortable This is because it has a high level of sinkage, and can feel like it’s enveloping the body. Some report feeling like they are trapped in the mattress. For those who enjoy moving around a lot in their sleep, memory foam may feel restrictive. Memory foam also offers little to no bounce. Memory foam is not known for being very breathable, meaning the mattresses can retain a lot of heat and cause the user to sleep hot. This can feel clammy or sweaty. Many memory foam mattresses now come with a layer of cooling foam to mitigate this. A brand new memory foam mattress can be prone to “off-gassing” – releasing an unpleasant, chemical scent left over from manufacture. This does fade over time, though. Hybrid mattresses tend to walk the line between firmness and softness. This is because innerspring mattresses are usually very firm and supportive, while memory foam mattresses more soft and with more sinkage. The foam layer in a hybrid mattress also mitigates the feeling of unevenness or poking of a traditional innerspring mattress. Hybrid mattresses offer a good amount of bounce, making them better suited for amorous night time activities. The bouncing support can also help you get out of bed – which on a memory foam mattress can be notoriously tricky. The breathability of hybrid mattresses is generally — though not always — superior to a memory foam. They are less likely to become uncomfortably hot, which is great for those who have a higher body temperature or who live in a hotter climate. 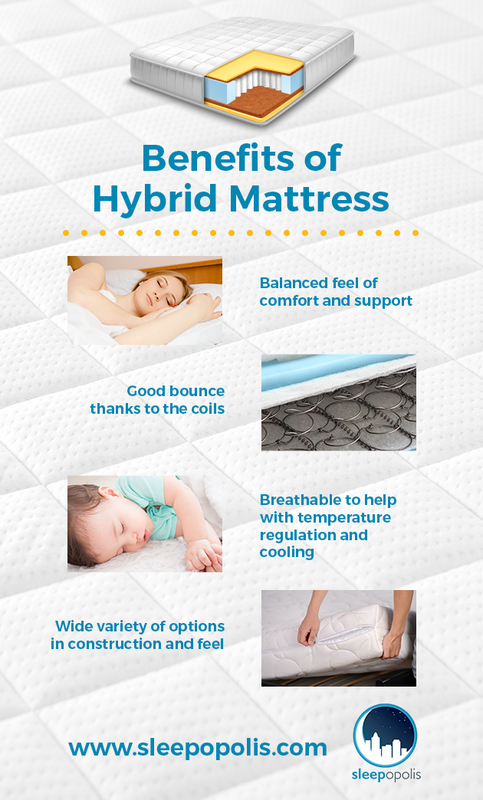 There is also a wider variety of choice within the hybrid mattress bracket. The levels and combinations of spring and foam can be changed around to find your perfect fit. For a fully memory foam mattress, the firmness and support tends to be quite similar across the board. Hybrid mattresses can be quite expensive. The memory foam layer can lead to bothersome heat retention – although this problem is less severe in a hybrid mattress than one fully made of memory foam. Alongside this, hybrid mattresses are usually quite heavy and cumbersome, making them difficult to maneuver and to store. Although there are benefits to the bounce of the hybrid mattress, the motion transfer can be bothersome for those who share a bed, particularly with a partner who moves around a lot. You have specific back problems or issues with spine alignment or painful joints. You’re a snorer (or sleep next to one). You bed partner moves around a lot and wakes you up. You dislike the feeling of sinking into a mattress. You sleep on your side, and thus require more firmness. You enjoy a feeling of bounce, or can struggle to get out of bed. You tend to run hot, and hate feeling sweaty in bed. 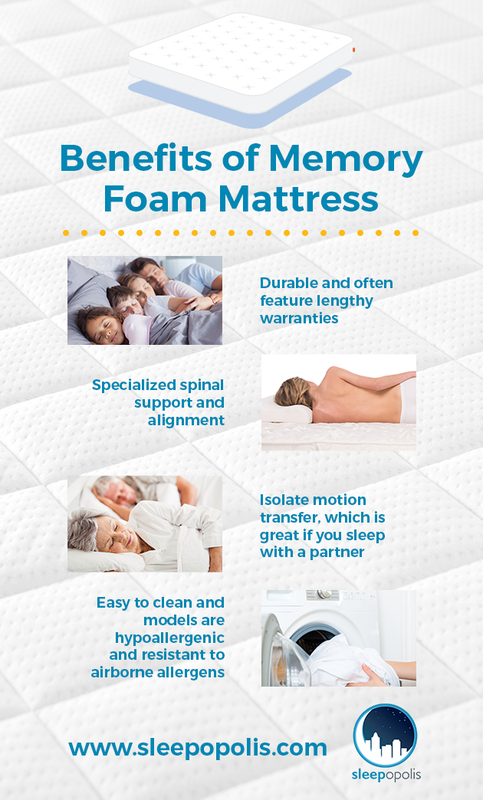 You want the benefits of both a memory foam and an innerspring mattress. If you’re interested in a memory foam mattress, Sleepopolis has a conclusive review guide featuring lots of different options, rated in terms of specific needs, and at a wide variety of price points, here. 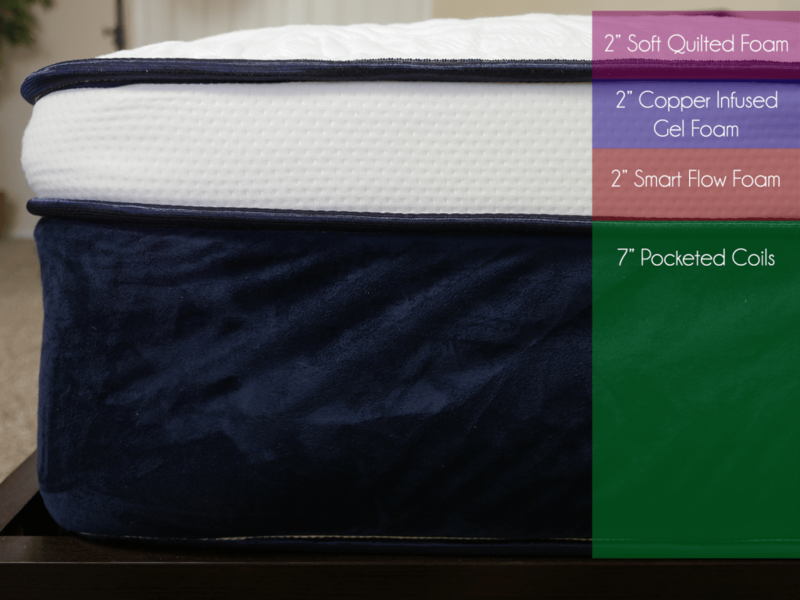 If you think a hybrid mattress is the one for you, Sleepopolis also has a review guide, detailing which mattress is most ideal for you needs, available here. What Are the Best Sheets for Memory Foam Mattresses?